Quincy Jones has worked as a musician, composer, arranger, producer, and film and television executive. He also helped Michael Jackson (1958–), Oprah Winfrey (1954–), and many others become stars. Quincy Delight Jones, Jr., was born in Chicago, Illinois, on March 14, 1933. His parents divorced soon after his younger brother, Lloyd, was born, and the Jones boys were raised by their father, a carpenter, and his new wife. She had three children of her own and three more with Quincy Jones, Sr. His birth mother, Sarah Jones, was in and out of mental hospitals, and it was not until his adult life that Quincy was able to enjoy a close relationship with her. When Jones was ten years old his family moved to Bremerton, Washington, a suburb of Seattle, Washington. He began taking trumpet lessons at school, and three years later he met a fifteen-year-old musician named Ray Charles (1932–). The two formed a band and played in local clubs and weddings, and soon Jones was composing and arranging music for the group. After high school and a scholarship at Boston's Berklee College of Music, Jones was introduced to the life of a musician on the road. He toured with Dizzy Gillespie (1917–1993) in 1956 and Lionel Hampton (1909–2002) in 1957, and then he made his base in Paris, France. He studied with composer Nadia Boulanger (1887–1979), wrote for Harry Arnold's Swedish All-Stars in Stockholm, Sweden, and directed the music for Harold Arlen's production Free and Easy, which toured Europe for three months, ending in early 1960. After an unsuccessful tour of the United States with a band made up of eighteen musicians from Free and Easy, Jones worked as musical director at Mercury Records in New York. He became the first African American executive in a white-owned record company in 1964 when he was promoted to vice president at Mercury. He produced albums, sat in on recording sessions, and wrote arrangements for artists at Mercury as well as other labels. Jones wrote for Andy Williams (1928–), Peggy Lee (1920–2002), and Aretha Franklin (1942–), as well as arranging and conducting It Might As Well Be Swing, an album featuring Frank Sinatra (1915–1998) and the Count Basie (1904–1984) Band. Jones's first venture into Hollywood came when he composed the score (the music that accompanies a movie) for the 1965 film The Pawnbroker. Jones won an Academy Award for his score for In Cold Blood (1967) and went on to write the music for over fifty films. In 1969 Jones signed a contract as a recording artist with A&M Records, and his first album with that label, Walking in Space, won a Grammy for best jazz instrumental (without vocals) album of 1969. Television has also featured Jones's music, starting in 1971 with musical scores and theme songs for such shows as Ironside and Sanford and Son. In 1973 Jones co-produced "Duke Ellington, We Love You Madly," a special for the Columbia Broadcasting System (CBS), featuring a forty-eight-piece orchestra conducted by Jones. The special was a project of the Institute for Black American Music, a foundation formed by Jones and other musicians with the goal of increasing awareness of the African American contribution to American music and Duke Ellington (1899–1974) in particular. Jones also wrote the score for the successful 1977 television mini-series Roots. Burned out from producing film sound-tracks, Jones stopped working for Hollywood in 1973 to explore his own music career as a vocalist. His singing debut was with Valerie Simpson on an album called You've Got It Bad, Girl. The title song from the album stayed at the top of the charts for most of the summer of 1973. Jones's next album, 1974's Body Heat, was an even bigger hit. Containing the hit songs "Everything Must Change" and "If I Ever Lose This Heaven," the album sold over a million copies. In 1974 Jones nearly died after suffering two aneurysms (irregular stretching of blood vessels) two months apart. After a six-month recovery he was back at work, touring and recording with a fifteen-member band, with which he released the album Mellow Madness. After Jones's 1980 album The Dude won five Grammy awards, he signed a deal with Warner Brothers Records to create his own label, Qwest. It took Jones almost ten years to make his next album, Back on the Block. During that time he produced hit albums for other artists, including Michael Jackson's Thriller (1983), which is still one of the bestselling albums of all time with forty million copies sold. Jones also has one of the bestselling singles of all time, "We Are the World," to his credit. Another triumph for Jones in the mid-1980s was his production of The Color Purple, the film version of Alice Walker's (1944–) novel, which featured the first film performance of Oprah Winfrey. In the early 1990s Jones worked on a huge, ongoing project, "The Evolution of Black Music," for which he had been gathering material for years. He was back in television as well; the Quincy Jones Entertainment Company produced the National Broadcasting Company (NBC) comedy Fresh Prince of Bel-Air and as a weekly talk show hosted by Jones's friend the Reverend Jesse Jackson (1941–). Jones also worked on a film biography of the black Russian poet Alexander Pushkin (1799–1837). Quincy Jones Broadcasting and Time Warner bought a New Orleans, Louisiana, television station, WNOL, which Jones was to oversee. Quincy Jones has been married and divorced three times, and his six children have only recently been able to spend time with and come to know their father. The 1990 documentary Listen Up: The Lives of Quincy Jones contains scenes in which Quincy discusses his difficult childhood, his mentally ill mother, and his strained past with his children. The film also contains interviews with Frank Sinatra, Michael Jackson, and others who describe Jones as a hard worker with a creative brilliance that has influenced popular entertainment since 1950. In 1993 Jones started Vibe magazine, a well-received African American music journal. In 1995 he released Q's Jook Joint, featuring the talents of many of his friends such as Ray Charles and Stevie Wonder (1950–). The album was a celebration of his fifty years in the music industry. In May 2000 the Quincy Jones Professorship of African American Music was established at Harvard University in Massachusetts. In January 2001 Jones received the first Ted Arison Award from the National Foundation for Advancement in the Arts, named for the man who created the organization. 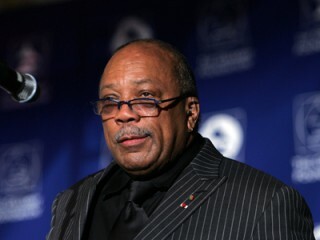 Later that year Jones contributed a song to the Ocean's Eleven soundtrack, published Q: The Autobiography of Quincy Jones, the story of his life, and received a Kennedy Center Honor in Washington, D.C. In February 2002 Q: The Autobiography of Quincy Jones won a Grammy in the best spoken word album category. View the full website biography of Quincy Jones.